San Jose State inducted eight legendary Spartan athletes into the SJSU Sports Hall of Fame. An engineer-turned-filmmaker directed and financed The Valley, an award-winning film that explores mental health in Silicon Valley. Students, alumni, veterans, ROTC cadets and members of the SJSU community came together at Levi’s Stadium. San Jose State’s Phyllis Forward Simpkins International House celebrates 40 years. Urban planners and developers learn how to build healthier communities. Here’s what Washington Square readers have to say. Publications from alumni and faculty authors. 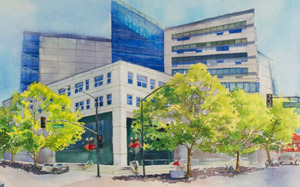 To celebrate its 10th anniversary, the Dr. Martin Luther King, Jr. Library asked San José State art students to paint the library from their perspectives. SJSU football coaches on their digital tools.